It technically isn't raptor season as they are around all year long. 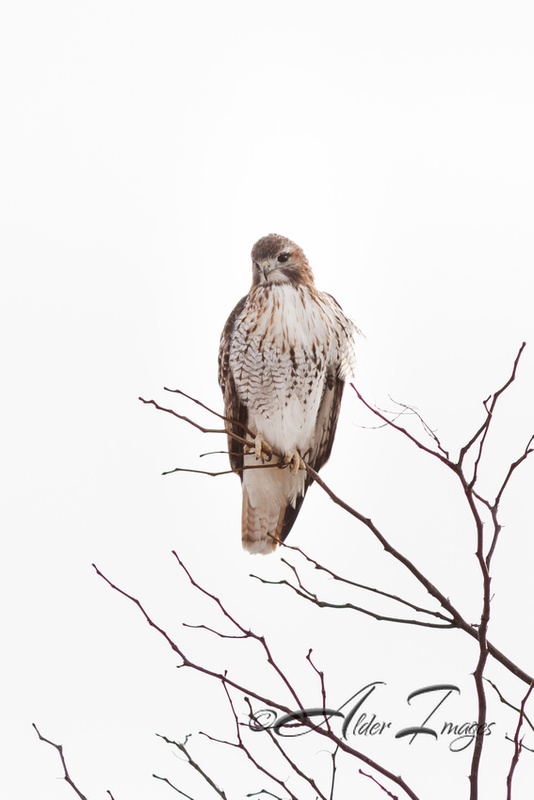 I consider this raptor season based on the ease of seeing these beautiful creatures. With the trees free of leaves that usually camouflage these majestic animals, they are easy to spot and sometimes easy to photograph. 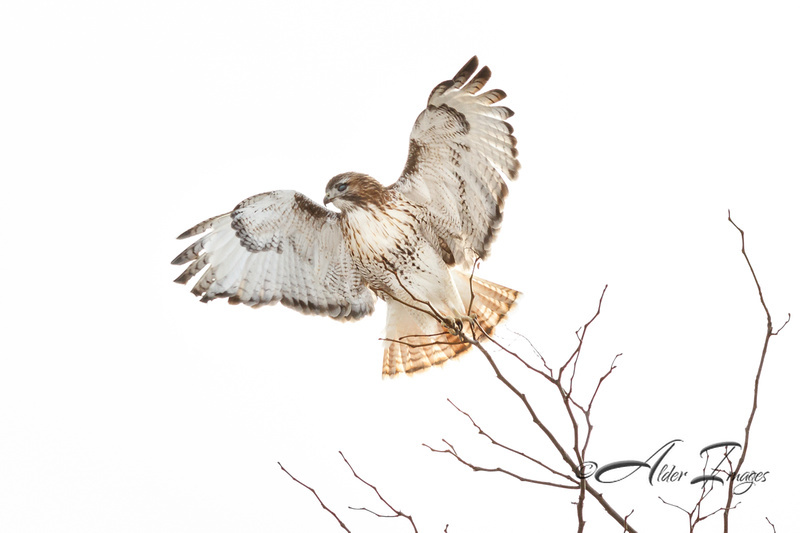 This particular Red-Tail had taken a rest while scanning for his next meal on a tree very close to the main parking lot at Standing Bear Lake. I stopped in a parking stall to show my youngest this amazing creature since he is very into wildlife. 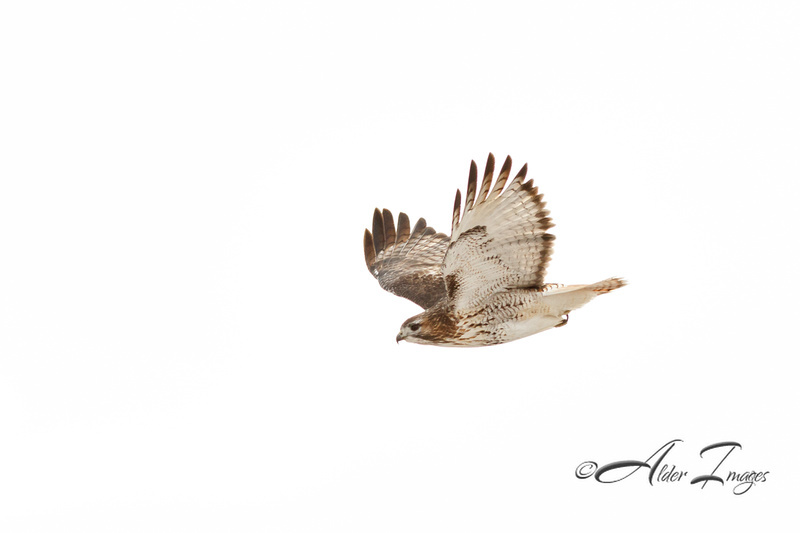 I was only able to snap a couple of photos of him as he saw something right as I was firing off a few. Not being prepared for the encounter, I only had my camera on continuous shooting instead of high speed. 3 frames per second compared to 8 really limits the amount of captures to get that perfect picture. Even with shooting 3 frames, I was still able to capture the shots that I wanted. Hope you enjoy! As always, if you would like to see a bigger version of this photo, click on the photo to be taken to my website at Alder Images. 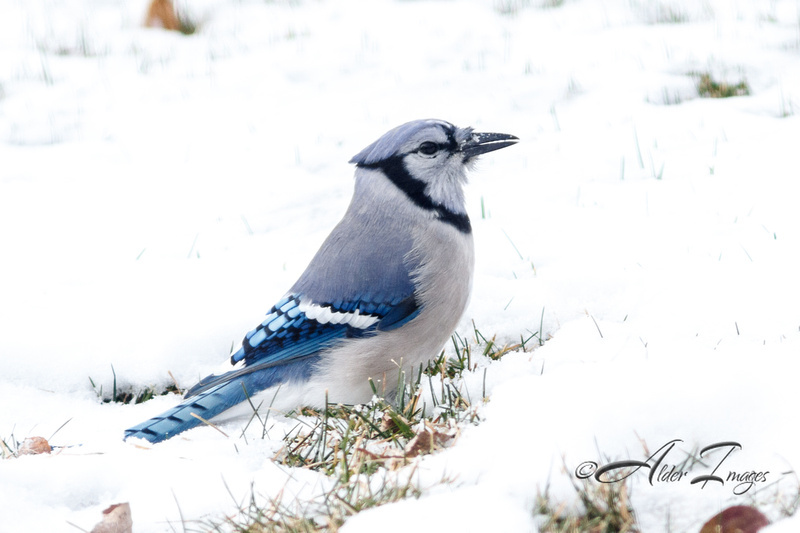 I have captured many Blue Jays before, but never in my front yard. I have often set food out waiting to see these beautiful yet bossy birds. It took snow for one of them to finally find his way here. I didn't want to chance him flying away before I got my camera on him, so I ended up taking this through the front door window. It definitely degrades the photo from what the bare glass of my lens would have done, but it still turned out pretty good with a little deeper post-processing. I spilled some seed in the yard filling while making a DIY bird feeder with the littlest. The snow came through and the spillage was covered. Yesterday, it was finally warm enough for the snow to melt ever so slightly. It sure didn't take long for the scavengers to stop by and start cleaning it up. I even caught glimpse of a Blue Jay. I haven't had one of these in my yard as long as I can remember. All I needed was a Cardinal, but I think they have moved from the neighborhood for the winter. Who knows, maybe they will be here tomorrow. 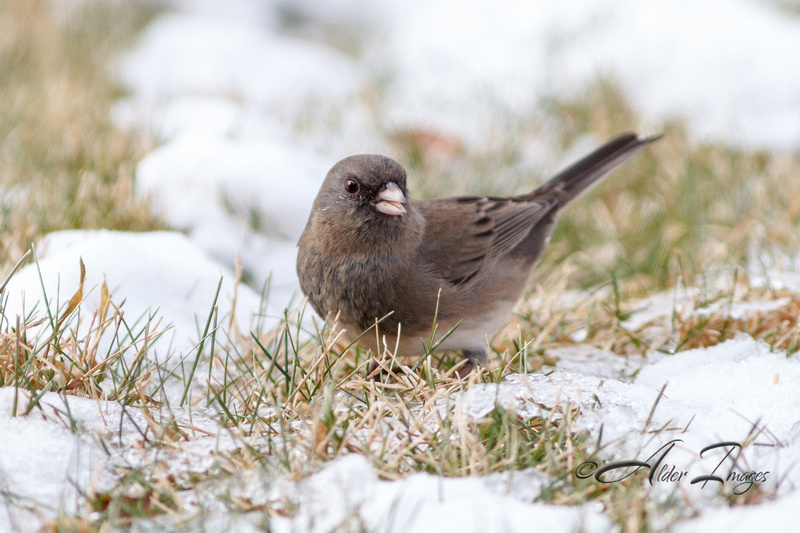 The first couple birds are Dark-Eyed Junco. They are usually around all winter long and are pretty cool little birds. They are very skittish however and very difficult to get your lens on up close. The others are House Sparrows which are much more comfortable with people. They may fly away at the slightest movement, but if you sit still they will make their way back to the food. 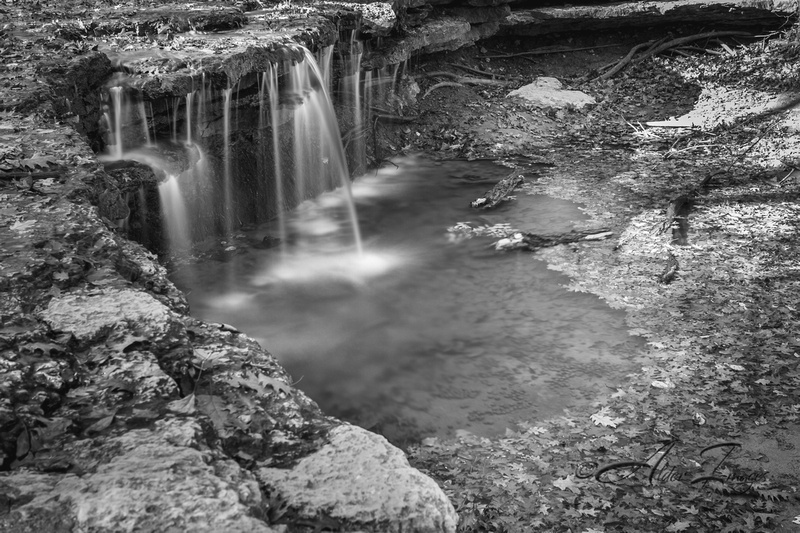 My youngest and I visited Platte River State Park earlier in the month. My two older boys were feeling left out as they had never viewed a real water fall either. On our trip, I was planning on photographing them with the falls in the background so they would have something to remember. I snapped a couple shots of the falls from the top before heading toward the lower falls. Our trip was abruptly halted at the sight of a mysterious dead squirrel that appeared along the walking trail. They got their fright a little earlier that planned. After all, it was Halloween. 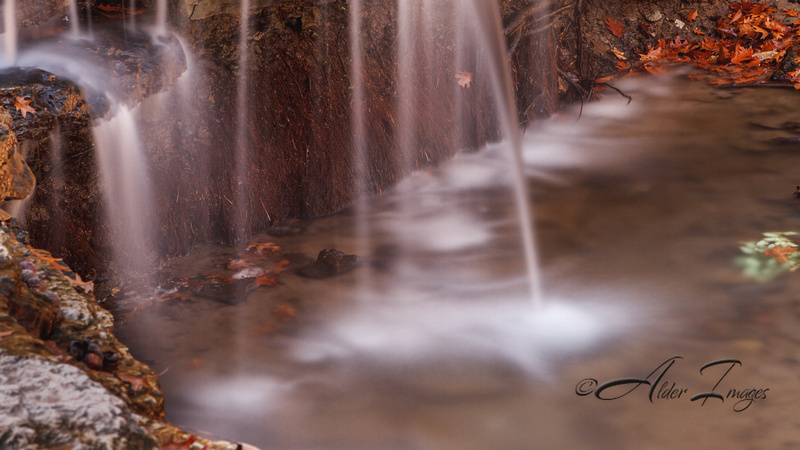 I had it suggested that I try to focus a little closer on the falls to get some of the intricate details. Even though there were beautiful fall leaves all over the ground, I believe a turn to black and white brings this photo to a whole other level. 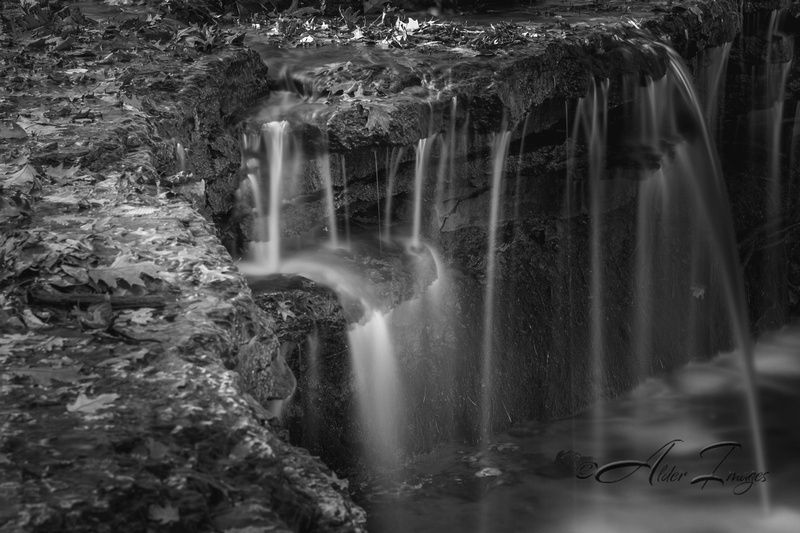 Here is another shot of the little falls that lead up to the larger.